After months of negotiations, the city of Kassel has opted to remove Olu Oguibe’s obelisk “Monument to Strangers and Refugees,” commissioned for last year’s Documenta 14. Earlier this year, Hyperallergic reported that Oguibe’s monument had been politicized by the City Council under pressure from the rightwing anti-immigrant party, Alternative for Germany (AfD). 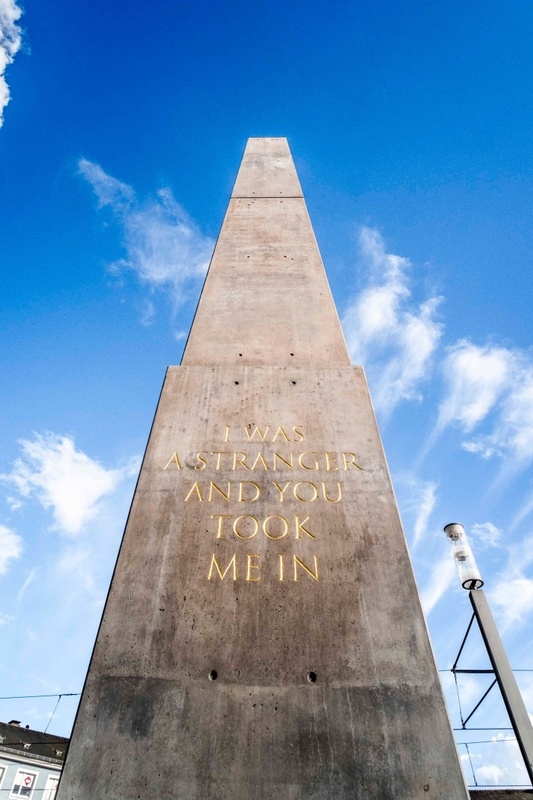 The work, designed as a site-specific piece for Königsplatz (King’s Square), a pedestrian zone in the city center, reads “I was a stranger and you took me in,” a verse from Matthew 25:35, inscribed in gold letters in German, English, Arabic, and Turkish. According to Oguibe, the work “was designed specifically for Kassel and the public square on which it stands,” intended as a “call to action” that brings to light the conditions that millions of refugees face who have been forced to flee their homes. In a meeting on September 24, which was to decide the fate of the obelisk, City Councillors opted to remove the statue indefinitely, rejecting earlier proposals given to Oguibe to place the work in Holländischer Platz — a less central location near a local university. To say that the city leaders tried in so many ways over the course of the past year to avoid acquiring the work would be a gross understatement. First, they claimed that a long proposed documenta Institute was going to be built near the city’s Holländischer Platz and insisted that the work must be dug up and moved there, although each and everyone one of them knew that it was a false claim. This false claim of a definite documenta Instituteon Holländischer led myself and several citizens to suggest that the work be left on the central square until the Institute is built on Holländischer Platz, and then, be moved there. I endorsed the offer because I knew that the city leaders’ claim about documenta Institute on Holländischer Platz was afalse claim. They naturally rejected the offer, anyways, and obviously for good reason. Even when the mayor offered to move the work immediately to Holländischer Platz, albeit against my wishes and the stated objections of numerous citizens, the city council refused to move the work toHolländischer Platz. Because there was no documenta Institute going to Holländischer Platz. I wrote at least two letters to the city mayor, Mr. Geselle asking questions about this and also, the fact that the deadline to return the public donations for acquiring the work had long expired. To date, Mr. Geselle never answered my questions. I think that the opinion of the artist is important. I am convinced that if at any time, city leaders had considered my opinion as the artist even remotely relevant or important, instead of treating it as completely irrelevant, or if they had considered the recommendations of the city’s own art advisory committee as relevant, we might already have long concluded the acquisition of the obelisk. Accordingly, plans are underway for the return of the work.The artist, together with his gallerist Alexander Koch, are preparing to receive the work back from the city, though no date, time, or exact plan has so far been released. UPDATE: After the controversy surrounding the obelisk’s uncertain future was reported by Hyperallergic, Olu’s representative Alexander Koch stated that he has and continues to offer to keep the work on loan until the city resolves their disagreements.